Our second day in Italy we knew would be a long one. 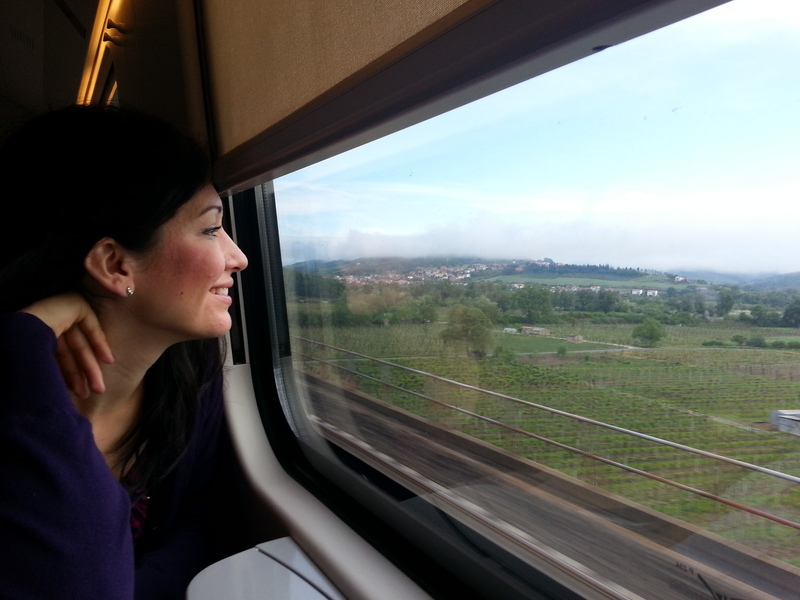 We planned on taking the train from Rome to Florence to Pisa and back again all in one day. If you’ve been with me for a while, you’ll remember when we did San Francisco in a day. My husband and I don’t mess around lol! Again, we were smart thinkers as far as planning was concerned because since our hotel was literally at the airport, we also had direct access to the metro. So, bright and early, we took the metro to the train station to downtown Rome. We made sure to leave plenty early in case we needed to figure things out when we got there. Thankfully, It turned out to be easier than we expected. The metro station was seriously a happening place. There were a ton of little stores to shop at with super cute stuff. This was surprising to me but I could see how it would be profitable. On the train. The views were amazing. 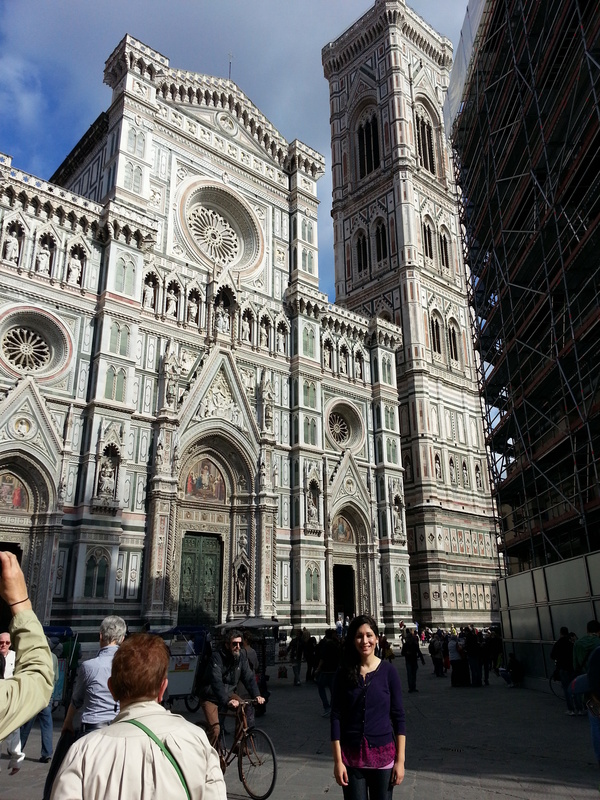 We connected in Florence and had about 40 minutes to spend. 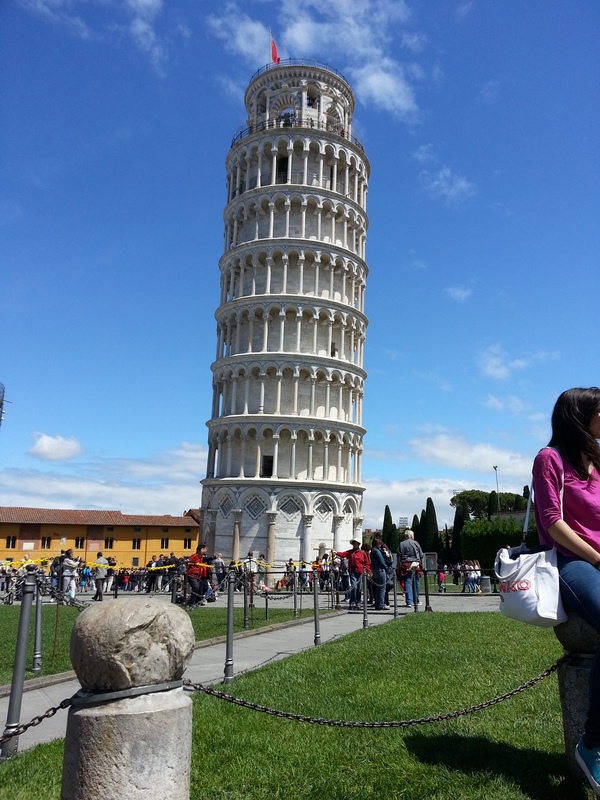 We could’ve bought a ticket straight from Rome to Pisa but we wanted to stop there on our way back and hang out. We didn’t mind this pit stop; we stretched out our legs and hung out a while. 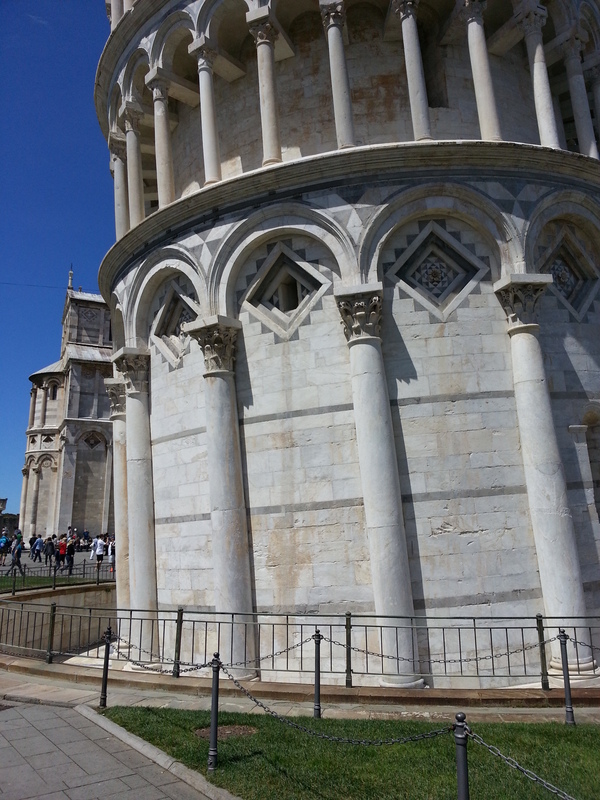 Once we got back on, about an hour and a half later we were in Pisa. First, I have to say that this was (ahhh!! I can’t believe I’m using past tense!!!) the #1 place I wanted to go to before I die. 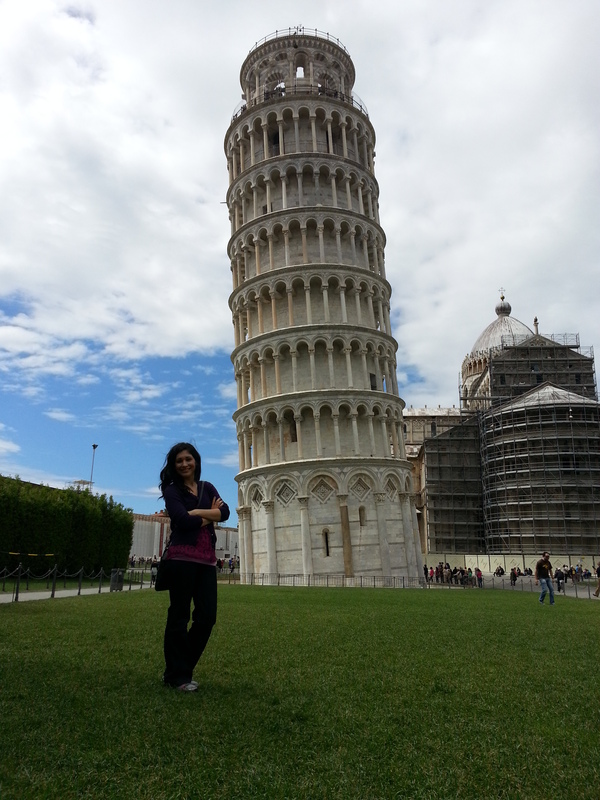 For some reason, the Leaning Tower of Pisa has always fascinated me and when people would ask my dream place to visit, I’d always say there. 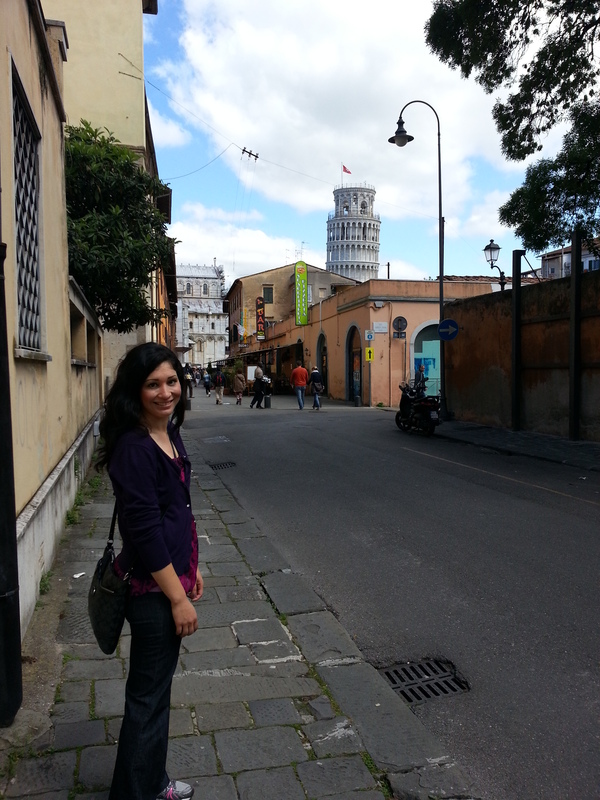 Just to see the tower. It was seriously just like the movies. This road led us straight to the tower. I was walking ahead of my husband; I was seriously a little kid about to go to their favorite store! I saw the tower peaking from the sky and stopped dead in my tracks. There it was. My eyes welled up and I whispered to my husband, “Do you see it?” He told me to stay still, that he wanted to capture this moment. Me incredibly happy. Best day of the entire trip, hands down. We kept going and it just got bigger and bigger and I became more and more excited. We crossed the street and heeeelllloooo people! 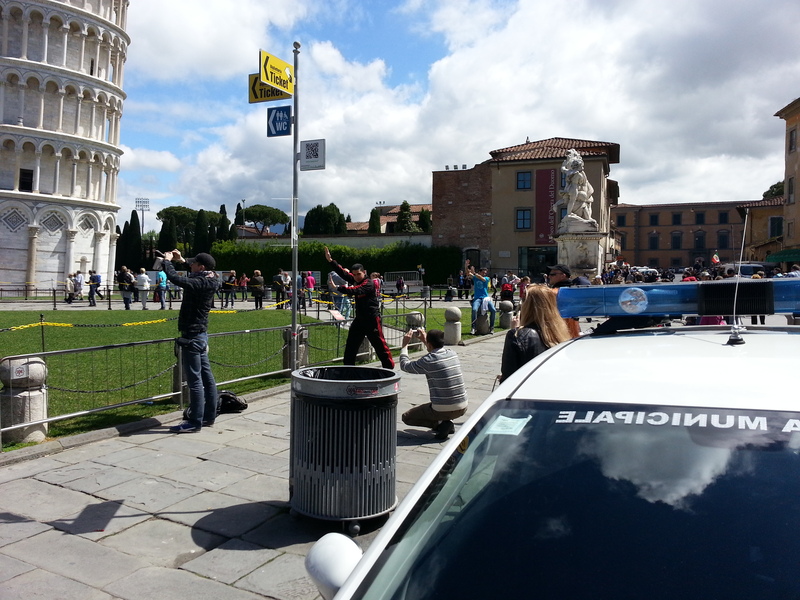 Really, the first thing I saw were a ton of people taking pictures of their friends and family “holding” up the tower. It was hilarious! I had to take a picture of the people taking pictures. And then it was our turn. Get comfortable. Tower picture overload is about to ensue. My husband wanted to bring back a souvenir for the kids. It was so funny hearing the people around me. There were moms yelling, “No! You’re not doing it right! More to the left. Higher!” And husbands and kids so over taking billions of pics. LOL! Luckily, my husband was totally cool with filling up our camera phones. Once we finished out photo shoot (you only got a glimpse), we walked back to the train station but not without making a pit stop for gelato along the way. 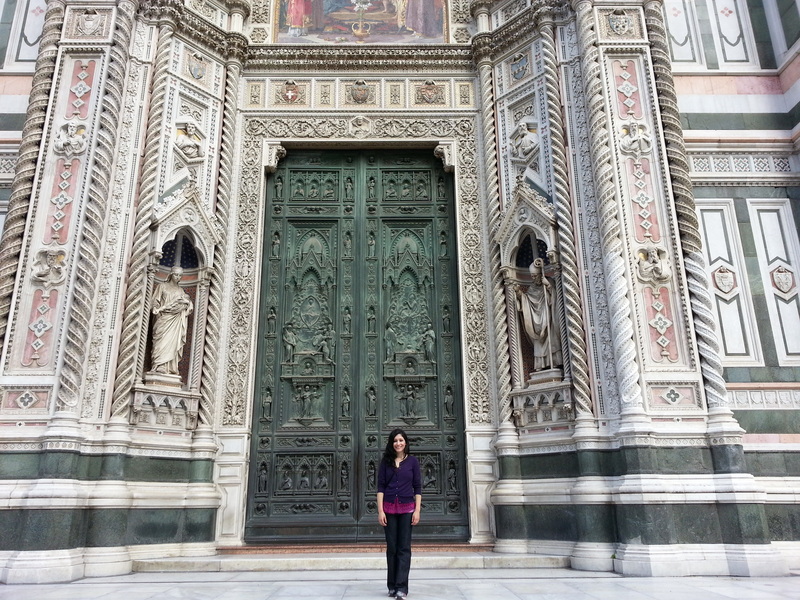 The train dropped us off in Florence where I wanted to cross off another bucket list item– to see in person the statue of Michelangelo’s David at the Galleria dell’ Accademia. There was a 45 minute wait in line that moved quickly and then we were in. No pictures were allowed (although we may or may not have snapped one accidentally). We sat on a bench and stared fascinated for a full thirty minutes. It was breathtaking. I’m just astounded first, by how intricate the statue is. It’s so incredibly detailed. Second, that this still exists! And that it’s all one piece after so many years. I’m blown away by history sometimes –at how things were done, what people were thinking when they were doing things, how long things have lasted. It amazes me. When we left the museum, we headed to the shopping district so to speak and I was able to window salivate at Hermes, Dolce & Gabbana, Christian Dior, and other European fashion houses. How I don’t have a picture of this, I don’t know. And then we ate gelato, again 🙂 It would’ve been nice to hang out longer but we had to catch our train and only had one more day left in Italy. 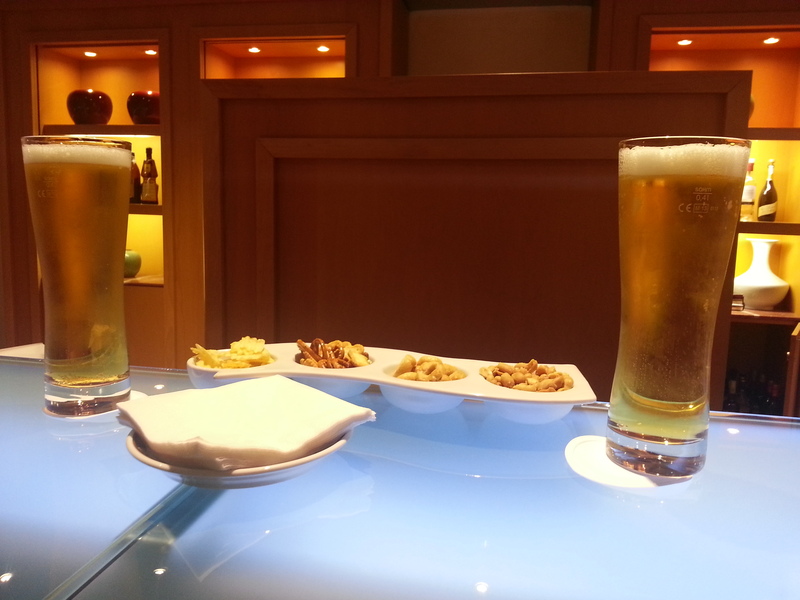 Took a break from the vino–Italy’s beer was actually pretty yummy. Next stop, Vatican City and the Sistine Chapel! We head north on our next trip in 2017. Thanks for the great travel tips, lol! Try and find Osteria Pizzeria in Rome. The best pizza anywhere! You’re going to love the Vatican but don’t be in a rush – there’s just way too much to take in. And try not to get too creeped out by the eyes on the Jesus tapestry following you. Bizzaroland! 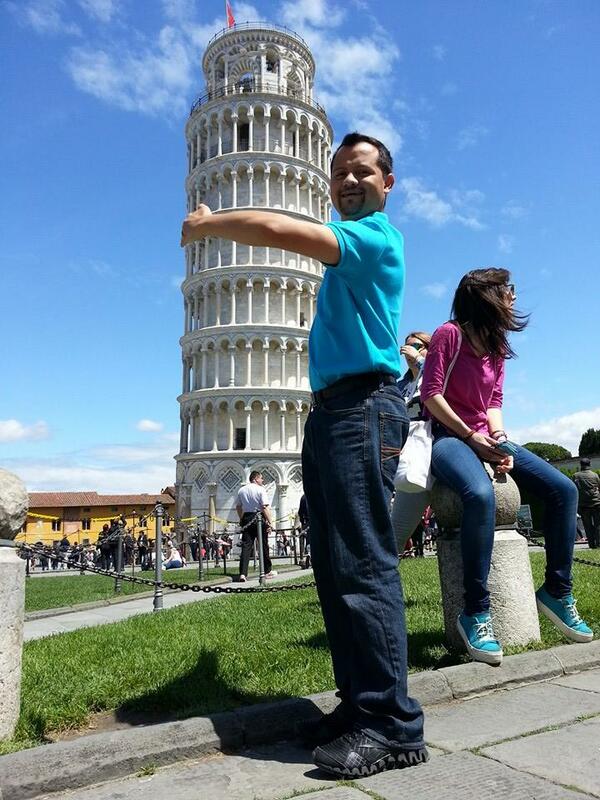 Very happy for you having crossed the tower off your list! If I ever manage to have the utmost pleasure to witness the northern lights I imagine there will be a tear or two shed on my behalf too! These pictures are so beautiful, especially the ones with you in it. What an amazing trip. So enjoying your journey! You look SO happy in all of these photos. We’re hoping to head to England to visit my husband’s family for Christmas this year…fingers crossed! Thank you!! I hope you guys go–would love to read about your experience! That looks so fun! But it does sound like a busy day! 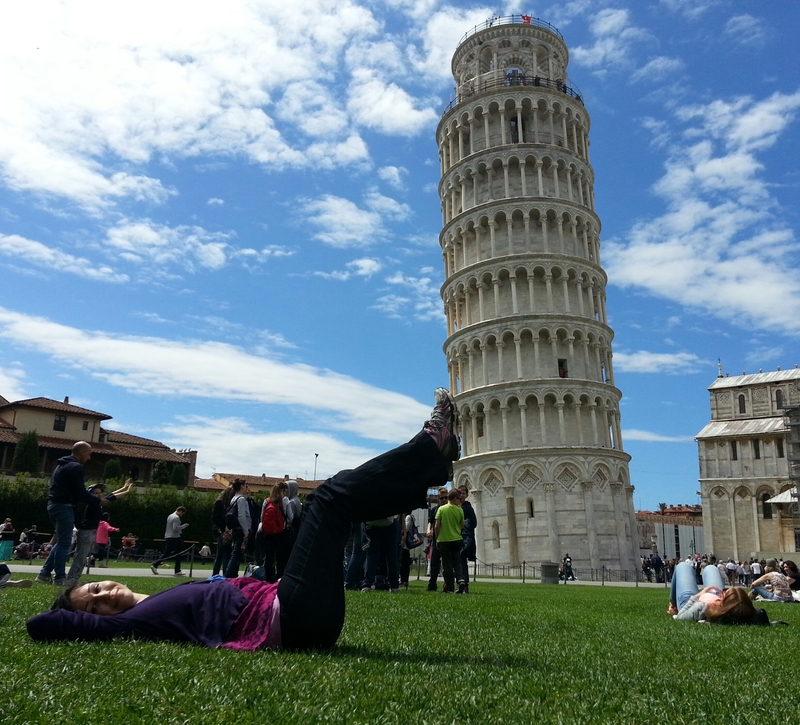 Your pictures are great – and you guys fit so much in one day! I’ve always wanted to go to Yosemite National Park – maybe next summer. Oh yeah, we don’t mess around! lol! Yosemite would be so awesome!!! I am way jealous of this one. 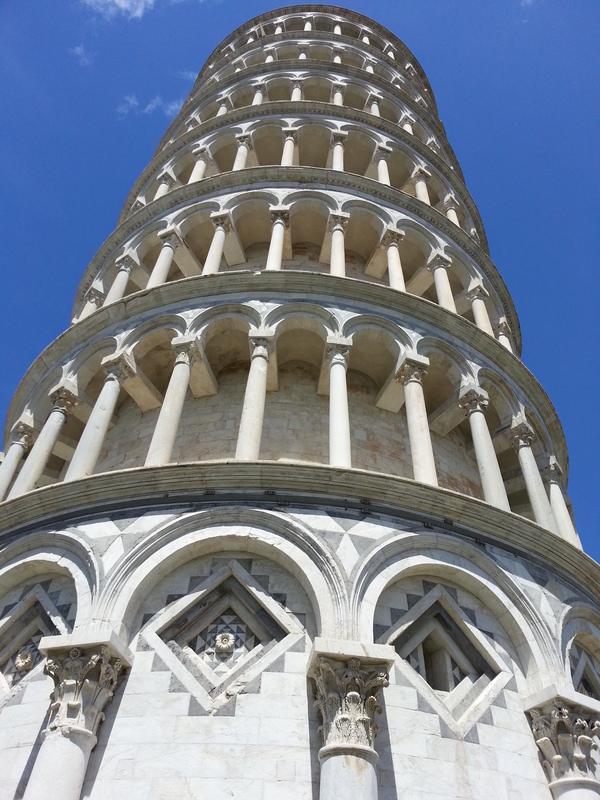 If we ever go back to Italy, Florence and Pisa are two I’d love to see. Venice is a must see for me also. I need to win the lottery so I can visit all of the places in the world I want to see! That would have been so cool! I sooo miss gelato from my trip to Europe – it just isn’t the same here! It’s def not! The gelato was amazing!! 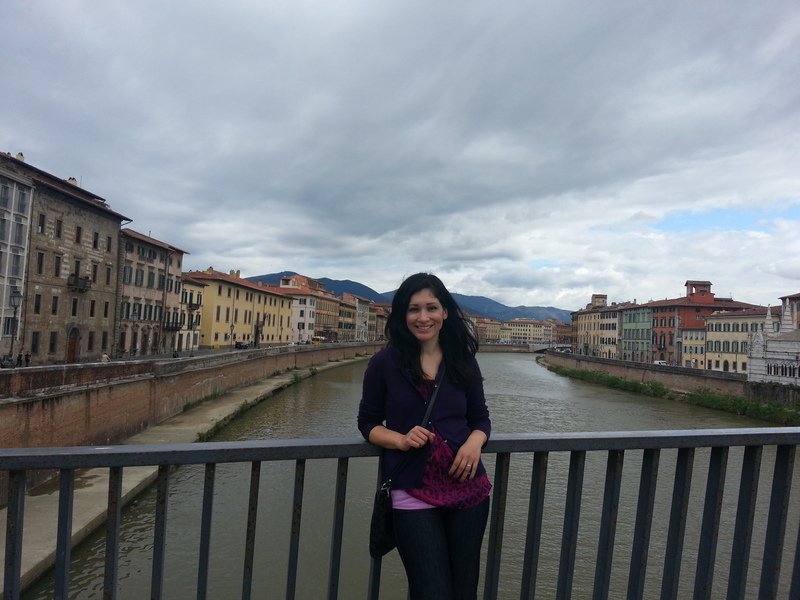 We didn’t make it to Pisa, but Florence was our fave stop in Italy! Love the pics!